I pulled on gloves to search the depths of the freezer, hoping to find more of last summer’s garden tomatoes. In the front I discovered two big snowballs that grandson Leo brought back from the mountaintop last week. Sure enough, way in the back was the last bag of those marvelous, sweet tomatoes. And, what’s this? 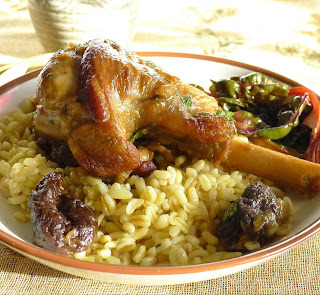 A lamb shank. And another. More, six of them. Frozen assets. For the past eight or ten months, every time I bought a leg of lamb, I had the butcher cut off the shank end at the joint. Individually wrapped and frozen, they added up to a great winter meal. 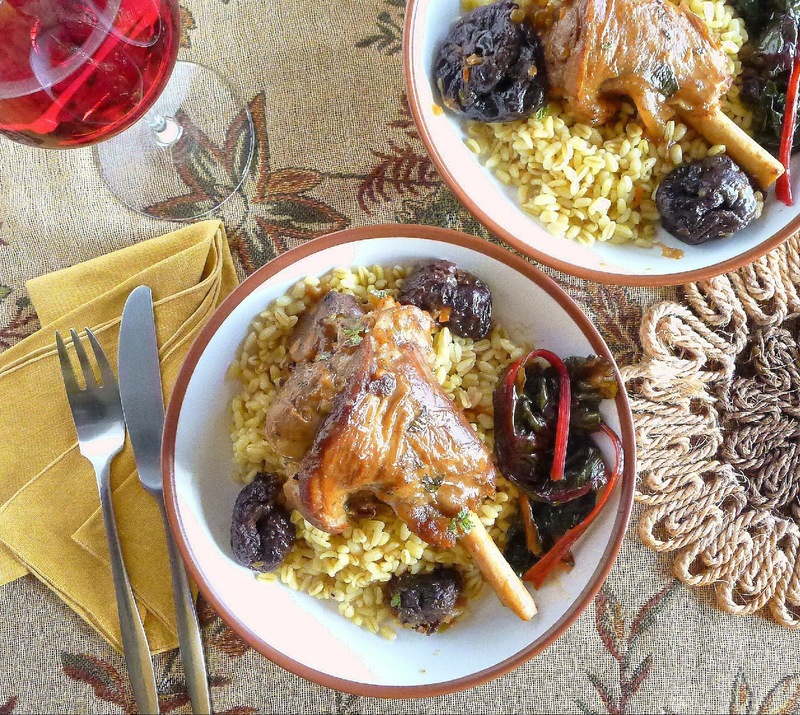 Lamb shanks are oven-braised with sweet wine and prunes. The recipe comes from my cookbook, My Kitchen in Spain, where it appears as “Moorish Lamb Stew with Prunes,” made with cubes of lamb rather than shanks. 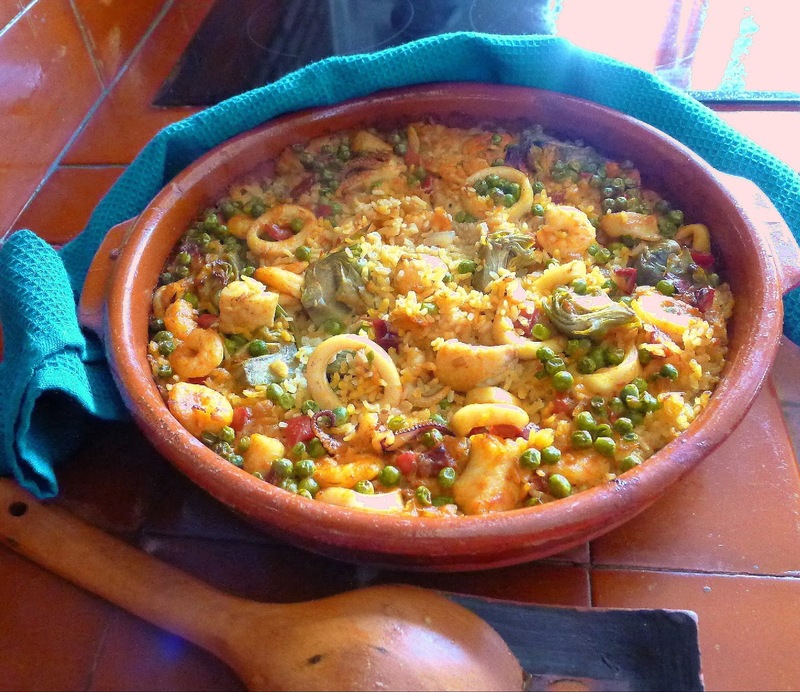 “Moorish” for the subtle blend of spices, more characteristic of medieval cooking than traditional Spanish home cooking. So, you know what wine to choose with the shanks—a red Rioja, crianza or reserva. My lamb shanks varied in shape and weight. The largest were very meaty and weighed about 13 ounces. Smaller ones, foreleg shanks, were about 7 ounces. One shank makes one serving. 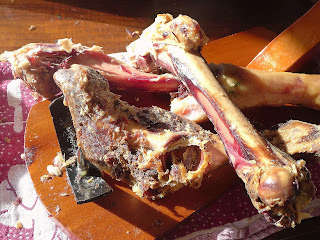 I also found a packet of lamb bones in the freezer, saved from boning-out a leg of lamb. I used them to make stock. If lamb stock is not an option, use chicken stock. Taste the stock when adding to the shanks and add salt if needed. You can serve the lamb shanks straight from the pan in which they cooked. Or, remove them to a heated serving platter and sieve or puree the cooking liquid. Serve the sauce separately. 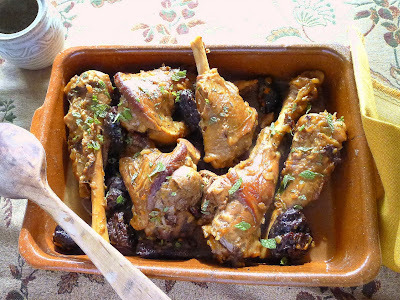 You can also braise the lamb and, once cool enough to handle, cut the meat from the bones. Reheat in the sauce. I served the shanks and the luscious sauce with trigo tierno, wheat berries that have been precooked so they are quick to cook, and rainbow chard from the garden. Sprinkle the lamb shanks with salt and pepper and allow them to come to room temperature. 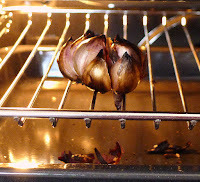 Heat 2 tablespoons of the oil in an oven-safe pan. Brown the meat on medium heat, turning the shanks to brown on all sides. Remove them. Brown the shanks before adding braising liquid. Add remaining 1 tablespoon of oil and the onion and carrot to the pan. Cook on medium heat, stirring frequently, until onion is quite brown, about 15 minutes. Stir in the crushed saffron and toast it 1 minute. Lightly crush the garlic cloves with the flat side of a knife and add them, unpeeled, to the pan. Add the lemon zest, cinnamon, cloves, ginger, lemon juice, wine and 2 cups of the stock. (Taste the stock for seasoning and add additional salt, if needed.) Place the lamb shanks in the pan in one layer. Cover with a lid or foil and carefully transfer the pan to the oven. Bake 45 minutes. Turn the lamb shanks. Add additional stock if needed. Cover and return the pan to the oven until meat is very tender, 45 minutes longer. Add the prunes and bake 15 minutes more. Sieve the sauce and serve it separately. Sprinkle chopped mint over the lamb shanks. Discard the cinnamon stick and whole garlic cloves. The lamb can be served straight from the pan or, if desired, transferred to a heated serving platter and the remaining pan juices sieved. 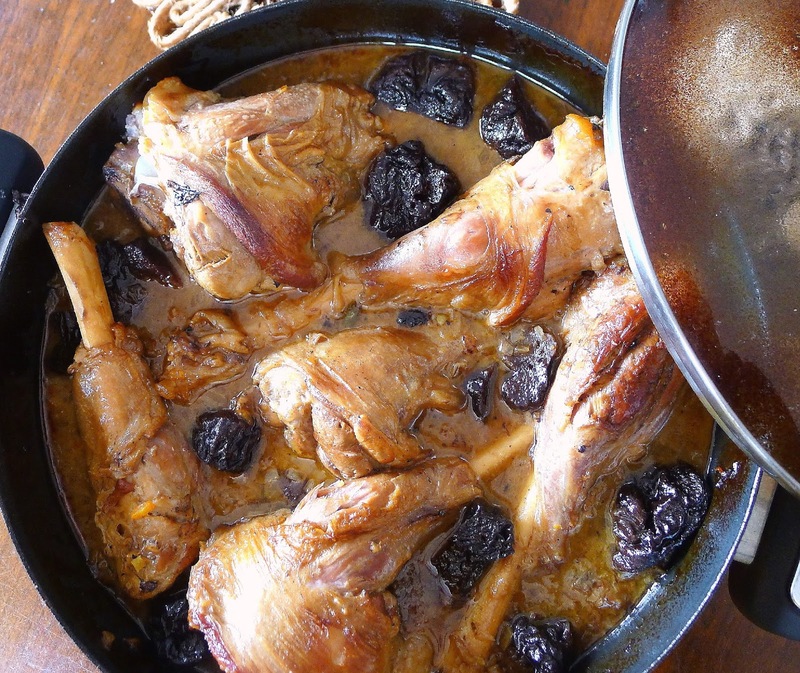 Place the prunes around the meat and spoon some of the sauce over it. Pass remaining sauce separately. 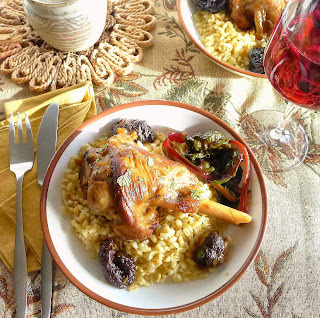 Serve the lamb shanks with a sprinkling of chopped mint. 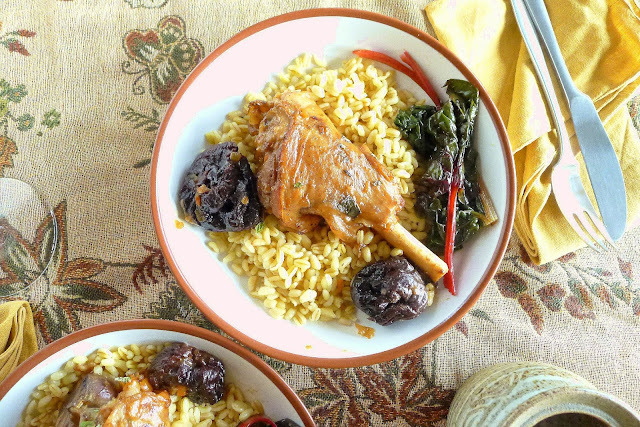 The sweet prunes complement the lamb. 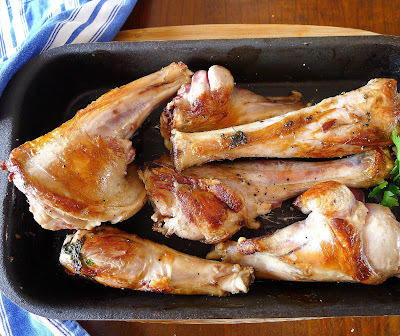 Lamb riblets with garlic sauce. Lamb kidneys in Sherry sauce. It’s snowing! Cold white stuff covers the roof tiles. As I snuggle in next to a roaring olive-wood fire, I imagine being stranded by snow at the bottom of our steep driveway. Only once before, way back in 1983, did it snow here. Snow in the sierra above my house. By morning, the snow has turned to rain showers and no trace remains on the roof. 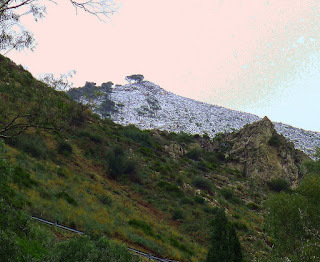 But, looking up through the high kitchen window, I see the sierra above me with a light coating of snow. The temperature has dropped to 5ºC/ 40ºF—not freezing, but way colder than normal for southern Spain. Time to fire up some soup. Chock full of pork, sausages and vegetables, garbure is a real stick-to-your-ribs, warm-up soup, from a region of Spain where they really know about cold weather—Navarra—Comunidad Foral Navarra—a region in northern Spain bordering Euskadi (the Basque provinces), La Rioja, Aragón and, in the north, France. The land ranges from the deep forests, torrential rivers and green mountain meadows of the Pyrenees, a land of cattle and sheep, to the wide valleys of intensive cultivation to the south and the low flatlands crossed by the Ebro River and its tributaries. 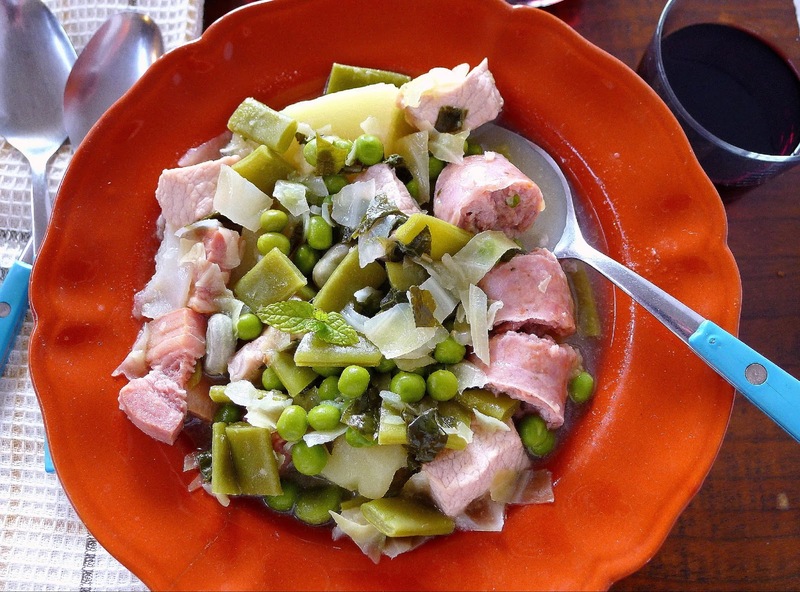 A meal-in-a-pot--pork loin, sausages and five kinds of vegetables. The remains of the ham--- A knob of ham bone flavors the broth. Get a butcher to saw the bones into pieces. 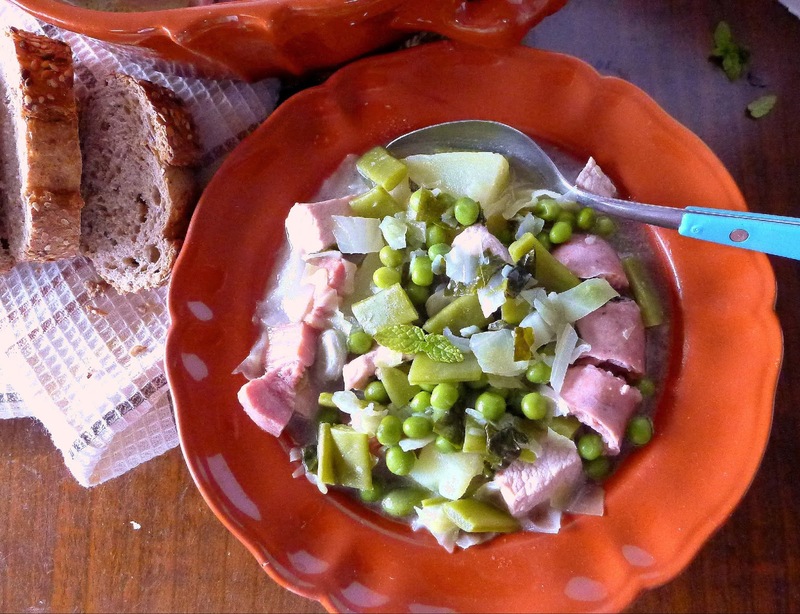 The soup, which has no olive oil, tomatoes or garlic--gets its flavor from a chunk of ham bone, the remains of a serrano ham, which lends its peculiar salty, pungent taste. After cooking, the bone is discarded, as any shreds of meat are inedible. The rendered ham fat in the broth conveys the flavor, so don’t skim it off. If you haven’t got a serrano ham bone, you could make a delicious soup with any ham bone or pork hock—though it wouldn't have that inimitable flavor of Spain. Garbure—related to the garbure of nearby Béarn (France)—is also called potaje de coles, cabbage pot. Other vegetables can be added. In Navarra, the local borage (boraja) might go into the pot. I decided to use kale from my garden along with the cabbage. 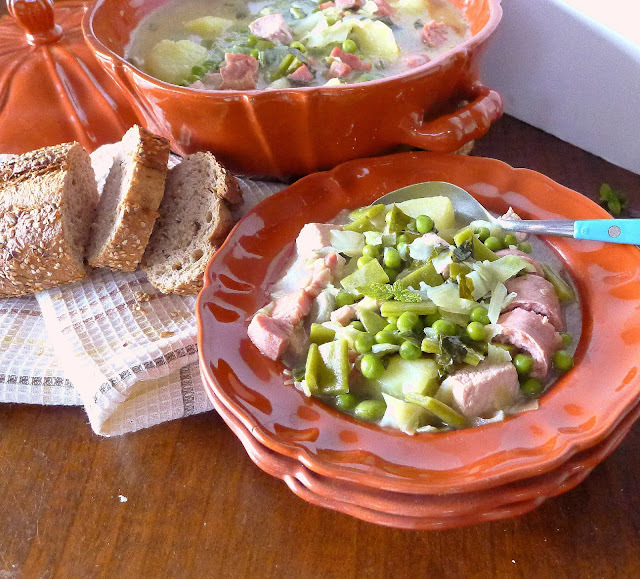 The garbure is a satisfying one-pot meal. Serve it with bread, a glass of red Garnacha wine from Navarra and sliced Roncal cheese, a Navarrese sheep’s milk cheese. A starter of piquillo peppers, another product from Navarra, would be nice. 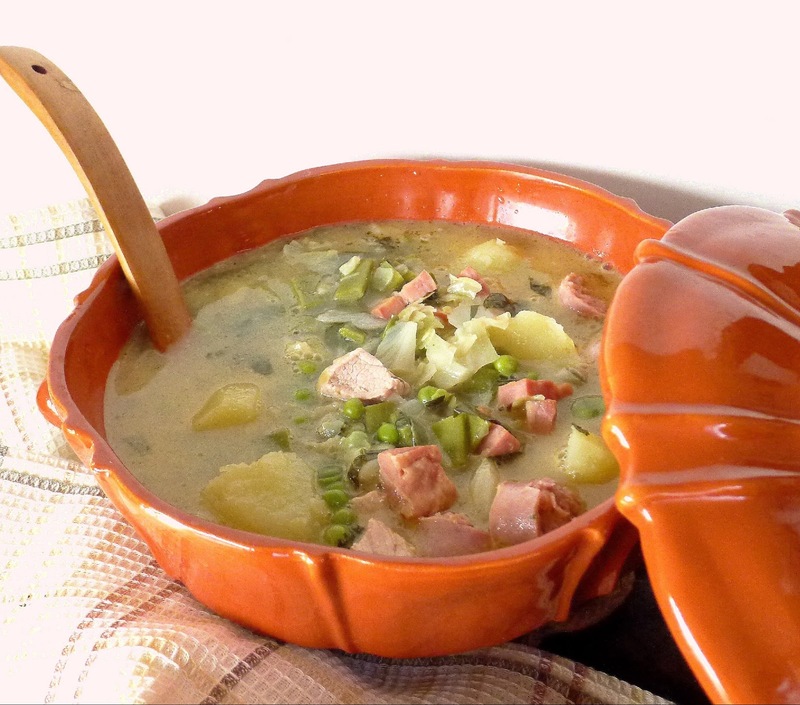 Bring the hot soup to the table in a tureen. Serve bread with the soup. And a glass of robust red wine. Garnacha is the principal wine variety in Navarra. Ham bone flavors the broth. Meat and veggies for the soup pot. 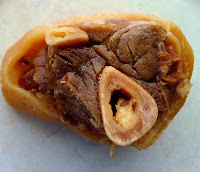 Place water and ham bone in a soup pot and bring to a boil. Skim off the froth that rises to the surface. Add the bay leaf, a few peppercorns, the onion stuck with the cloves, celery, parsley and carrot. Bring again to a boil, then lower heat and simmer 30 minutes. Taste the broth and add salt if needed. Simmer 30 minutes longer. Strain the broth and discard the bone and all solids. 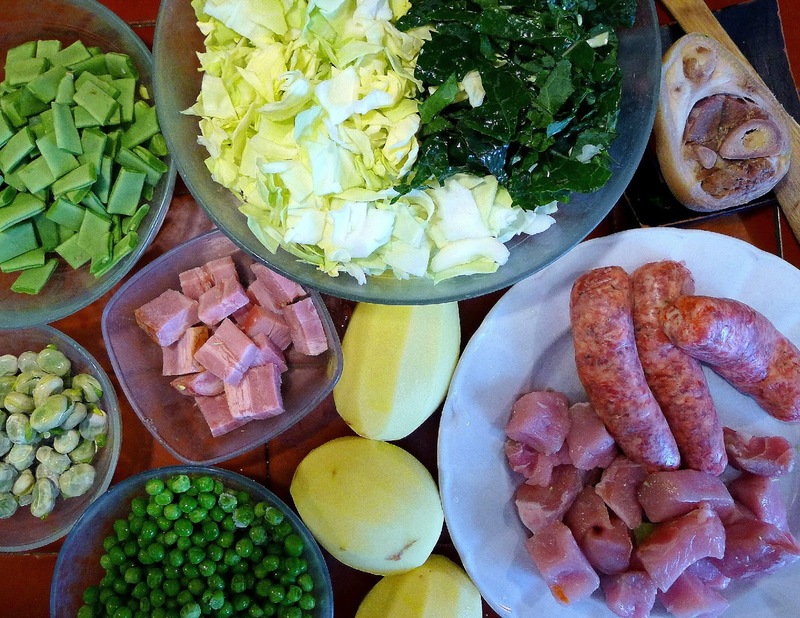 Broth can be prepared and refrigerated or frozen until needed. 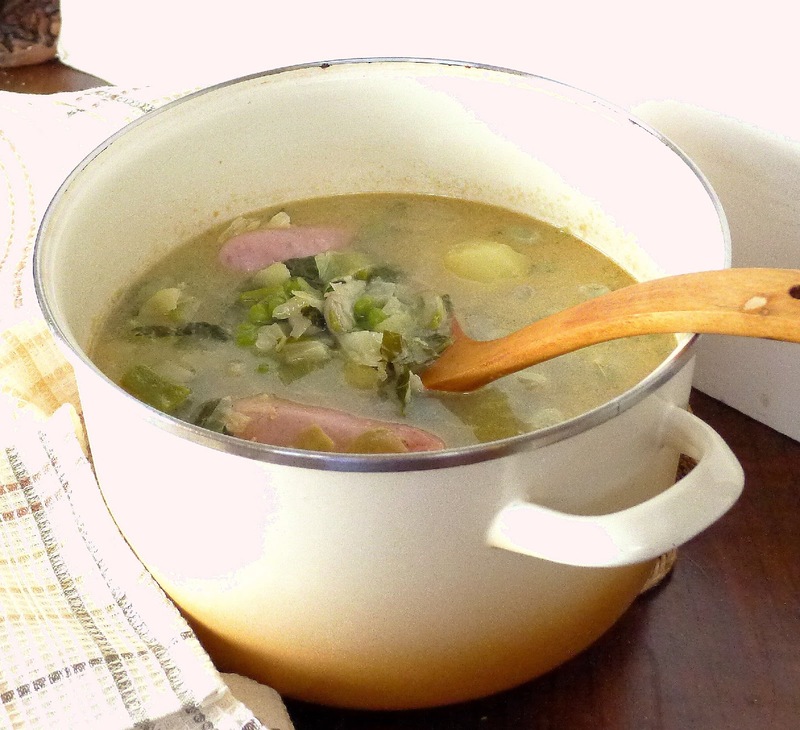 Place the ham broth (6-8 cups) in a soup pot and bring to a boil. Add the cabbage and kale, diced bacon and whole potatoes. Simmer 20 minutes. Add the pieces of pork loin, the sausage and green beans. Bring again to a boil and simmer 20 minutes, until potatoes, pork and meat are tender. Add the fava beans and peas and cook 5 minutes. Use kitchen scissors to cut the sausage links into bite-size pieces. Cut up the potatoes. Ladle the soup into a large tureen. Add a sprig of mint or parsley. 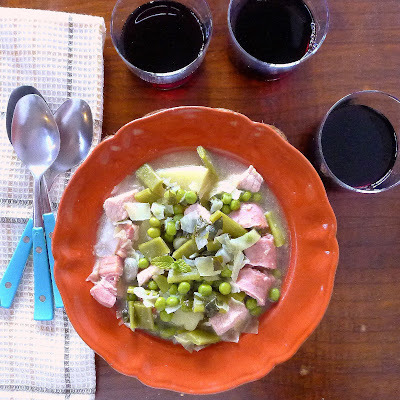 Mint complements the ham broth flavor. 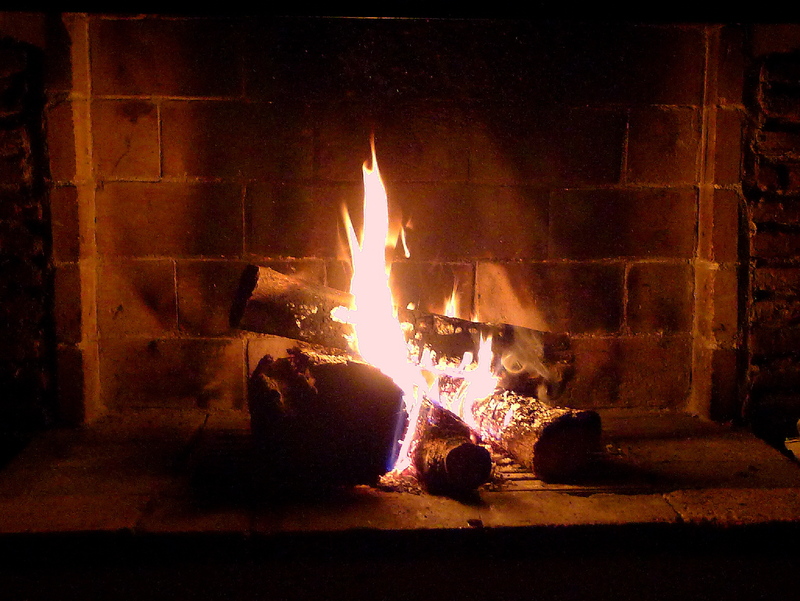 Keeping warm with soup and a blazing fire. 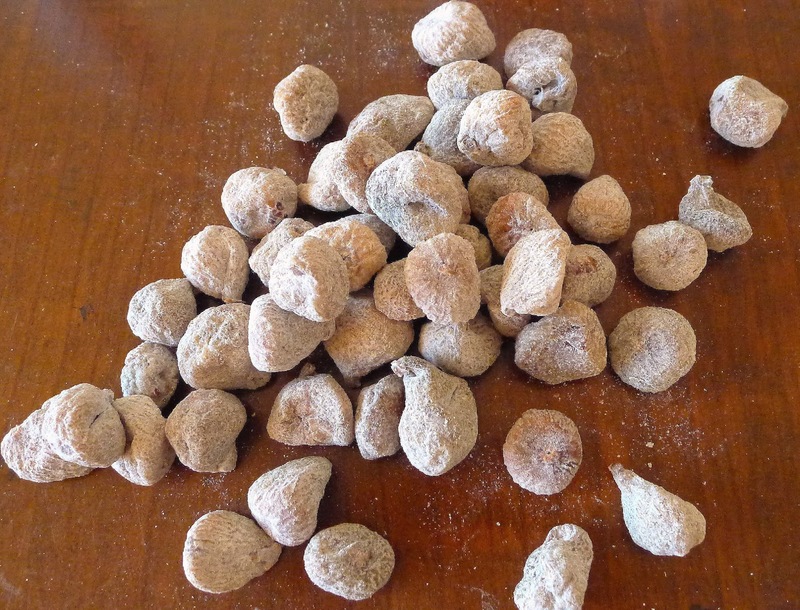 Dried figs from Málaga are dusted with rice flour before packaging. Figs grow throughout southern and central Spain. In former times the fruit was far more important than it is today, a source of sweetness. In late summer, ripe figs were picked and spread to dry in the sun. When fully dried, they were packed into a serete, a woven straw basket, and cinched tightly closed. The baskets were placed in a fig press, which consisted of a wooden frame threaded with a thick wooden screw hewn from hard holm oak, and winched down. Once pressed, the figs were impervious to insect infestation and would keep for months. Now I buy packaged figs, small Málaga figs that have been lightly coated in rice flour to keep them from absorbing moisture. (They can be eaten without washing.) There are also other varieties imported from Turkey. Any variety of dried fig can be used in the recipe. Cut small figs in half; quarter large ones. 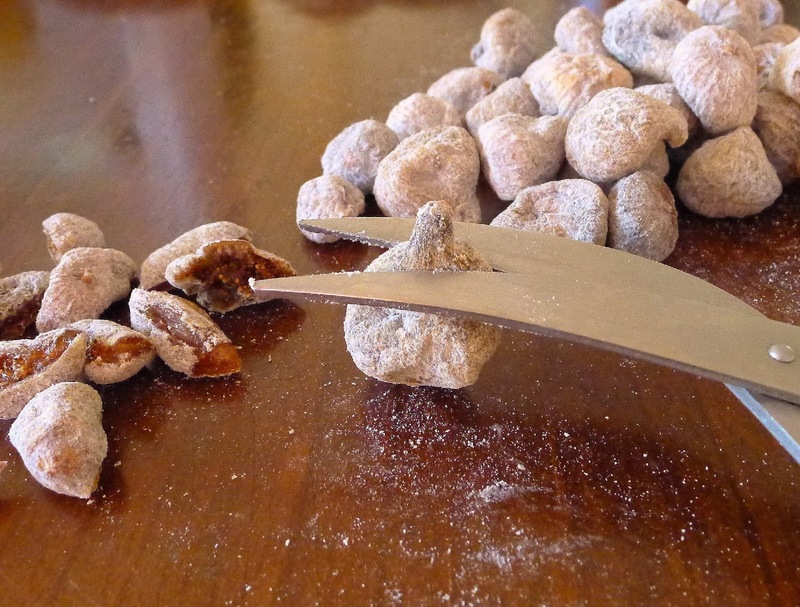 Dried figs are so sweet that, in my opinion, the dessert is sweet enough with no added sugar. Figs are enhanced with various spice combos--anisette and cinnamon, ginger and cardamom, or, as I have used, vanilla and lemon. Figs bake in a custardy-batter topped with nuts. 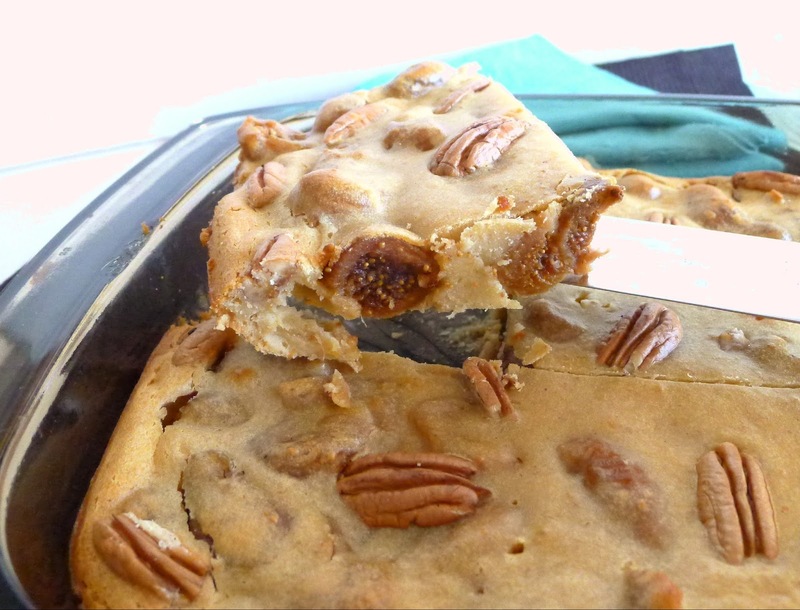 Dried figs are plumped in milk before mixing into the batter. 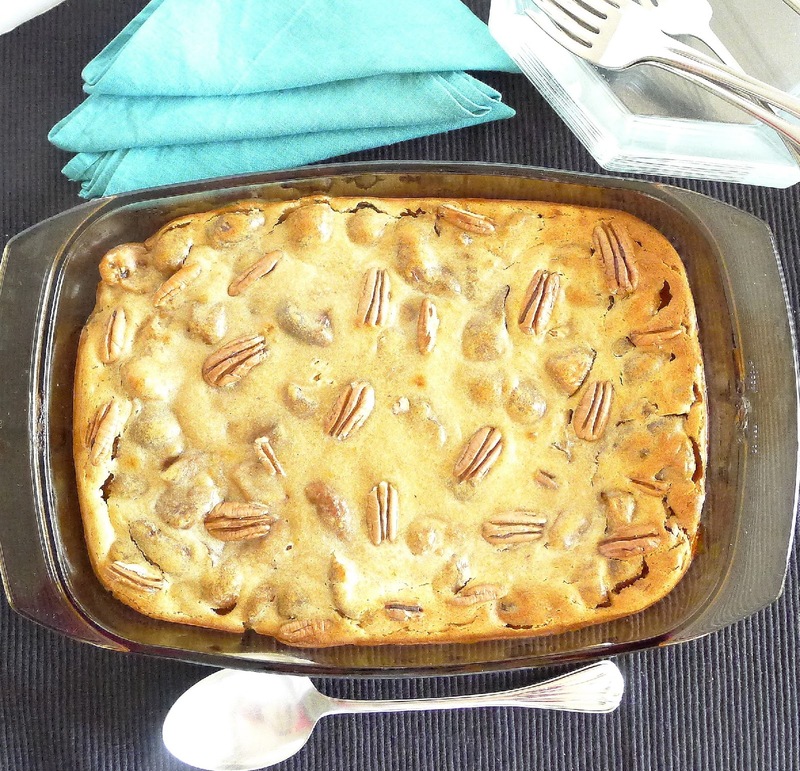 Dust the pudding lightly with confectioners' sugar immediately before serving. I found that the rice coating on the figs thickened the batter somewhat, so I used the larger quantity of milk. Use kitchen scissors to snip off stems. Cut away stems from the figs and cut them in half or quarters. Place in a heatproof bowl. Heat the milk with the vanilla pod and lemon zest. Pour the hot milk over the figs and allow them to soak until milk has cooled. Discard the lemon zest. Preheat oven to 400ºF. Oil a baking dish (11- 12-inch rectangle or oval). Remove the vanilla pod. Split it open lengthwise and scrape out the pulp. Add the pulp to a mixing bowl or blender. Add the eggs and oil and beat or blend until combined. Add the flour and salt and beat again to combine. Pour the batter over the figs and mix well. Spread the figs and batter in the baking dish. 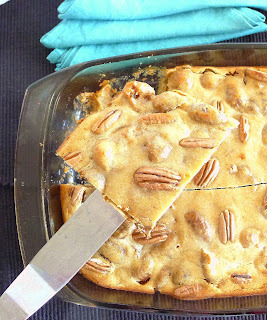 Sprinkle the top with slivered almonds or chopped nuts. Bake 10 minutes. Lower oven temperature to 350ºF and bake 25 minutes more. Pudding is done when a thin skewer comes out clean. 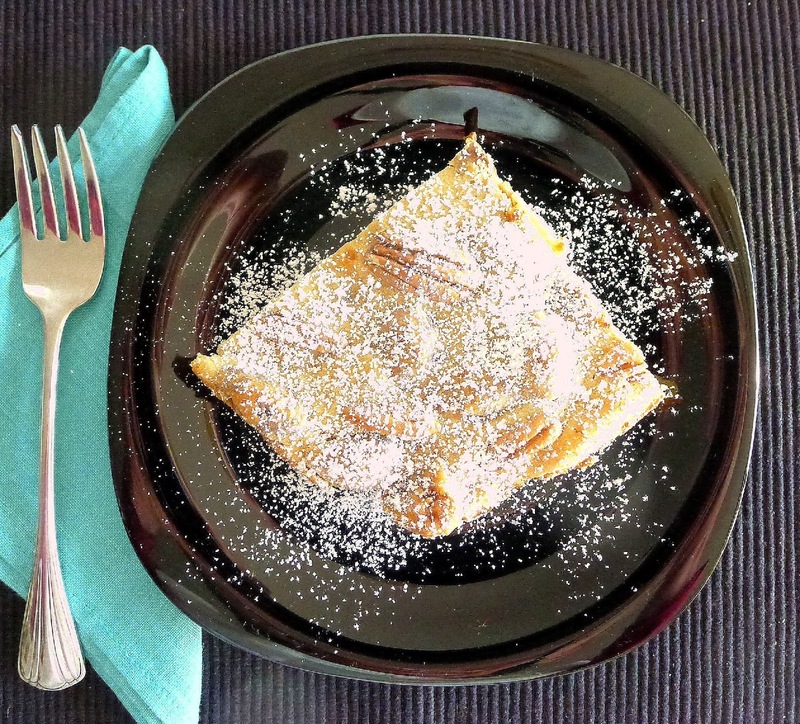 Serve hot or cold, dusted with confectioners’ sugar, if desired. 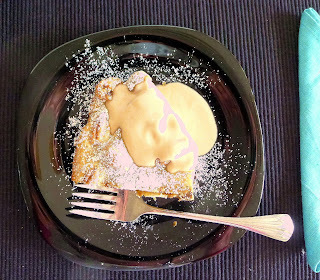 Serve sweet dessert sauce separately. Serve pudding with a sweet Sherry sauce. Combine the cream and Sherry in a small saucepan. Bring to a boil and simmer 2 minutes. Serve hot or cold. Fig and goat cheese flatbread. Salad with grilled chicken and figs. Pork loin with fig stuffing. My kitchen: new induction cooktop and electric oven! Oh no! I burned the lentil soup! In an instant, the lentils and carrots at the bottom of the pot scorched, ruining lunch and a perfectly good pan. This happened on my brand-new induction cooktop. I hadn’t intended to use it until learning more about how it works. But, as luck would have it, when I turned on the big old gas stove to heat up lunch, the burner sputtered out—an empty butane tank. Ben called some burly friends and they, unceremoniously, moved the old stove out. Bye-bye, bombonas (butane tanks). I put the pot on the new cooktop, turned up the heat dial and touched “P” for power. By the time I turned to get the soup bowls ready, the soup had scorched. I felt like a dolt. 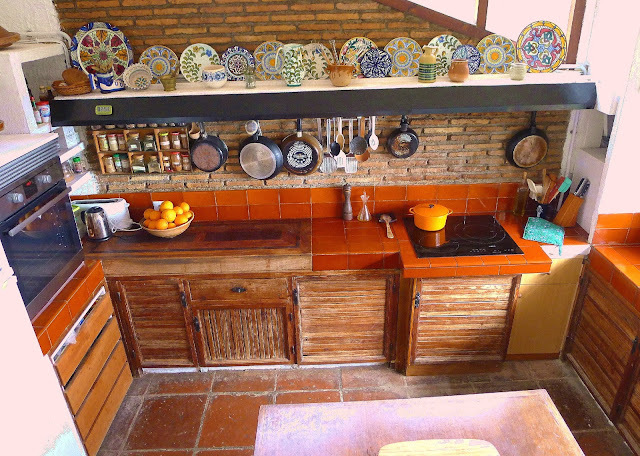 Or, anyway, a novitiate in the kitchen. There’s going to be a learning curve here, as I adapt to a new way of cooking. So, “P” for power is great for bringing a pot of water to a boil to cook pasta—but not for anything with solids that rest on the superheated bottom. 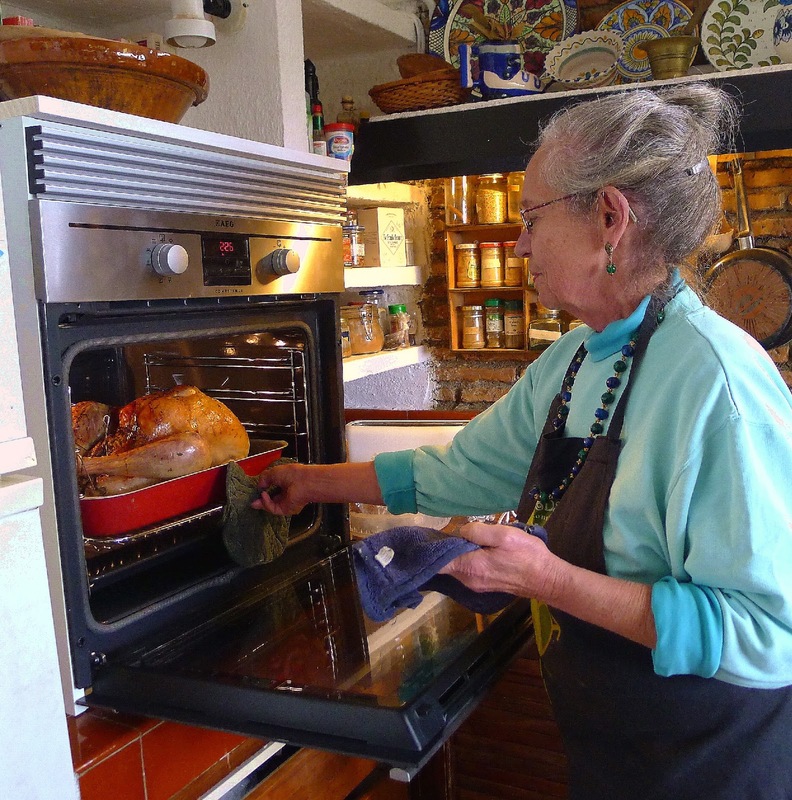 Smaller oven, but 11-pound turkey just fits! My new eye-level electric oven presented no orientation problems, other than needing to convert Fahrenheit to Celsius for temperature settings. I put in an 11-pound stuffed turkey, basted it with olive oil and white wine every 30 minutes. The turkey was roasted in less than three hours. While I made the gravy, I popped mashed potatoes with pimentón and roasted Brussels sprouts in the oven to reheat. I’m using the oven way more than I did the oversize one on the old gas stove. It is radically more efficient. 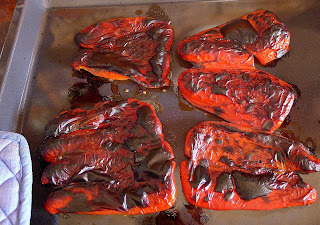 Plus, I need it to do a few things that I used to do on an open gas flame—like roast a head of garlic (to add to lentils or black-eyed peas) or roast bell peppers. 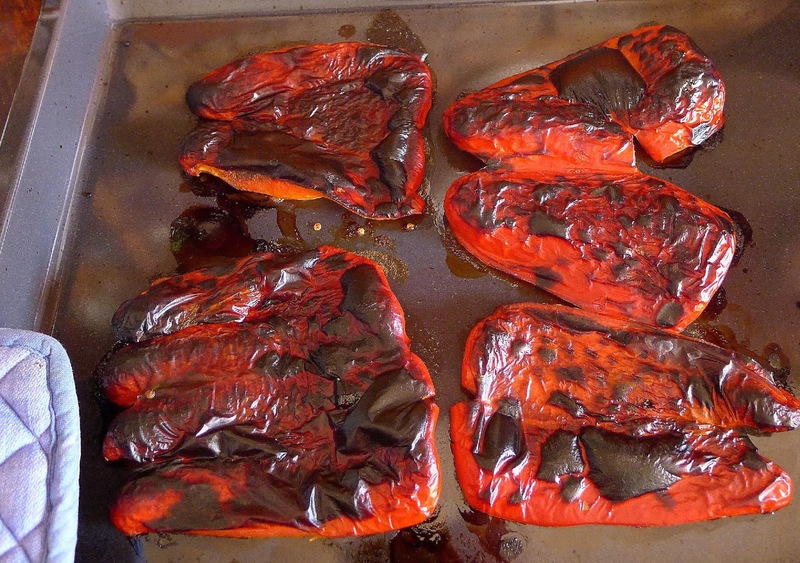 Cut peppers in half and flatten them to roast under broiler/grill. And, I can’t use my clay cazuelas and earthenware tagine on the cooktop (only pans with ferrous content, that a magnet will stick to, work on induction), so, until I get a special induction plate, I am using the oven for clay-pot cooking too. My first experiment—arroz marinero, seafood rice in cazuela—was a little off on the timing. Although I know from experience how earthenware holds the heat, I still managed to overcook the rice in cazuela! 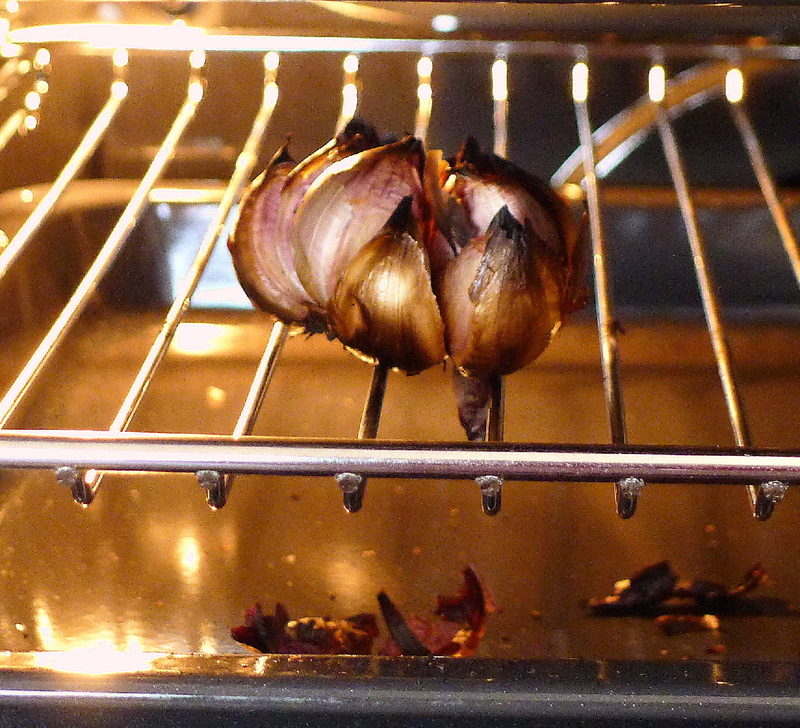 Note to self: stand back when opening the oven to avoid an eye-level blast of steam. 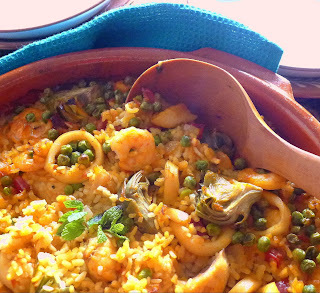 Rice and seafood, baked in an earthenware cazuela. 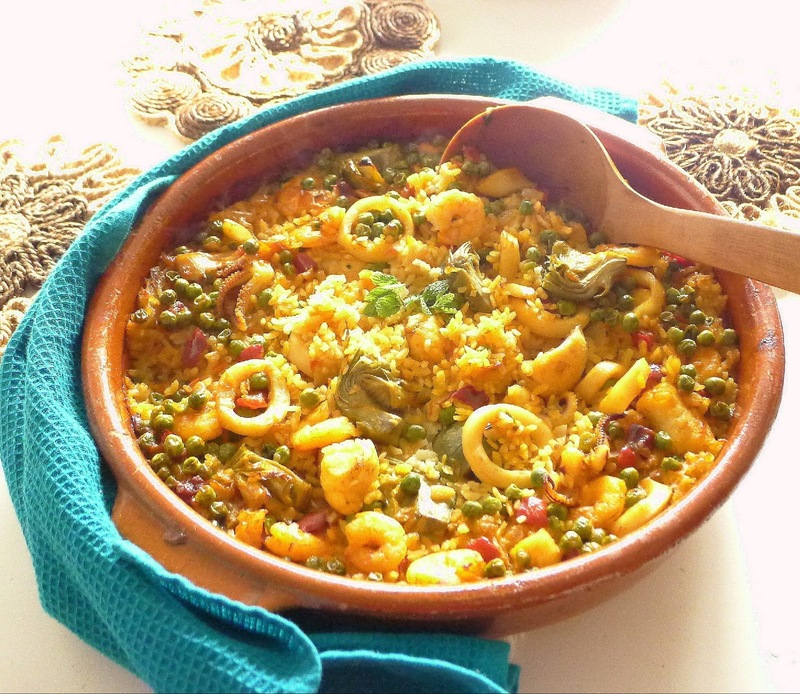 Bring cazuela right to the table to serve. A touch of saffron gives rice a golden hue. An earthenware cazuela takes a long time to come up to temperature, but once the liquid starts to bubble, the cazuela holds the heat for a long time. Take the rice out of the oven before it is completely tender and allow it to finish cooking in a 10-minute waiting time. Bomba is a variety of Spanish rice that doesn’t readily overcook and turn mushy. 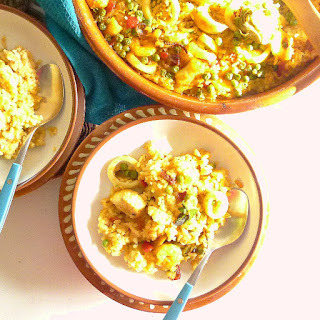 If not available, use medium round-grain paella rice or Italian risotto rice. If you can get whole shrimp with the heads on and you don’t mind peeling them, they’re best because the shells add flavor to the oil for cooking the sofrito. If whole shrimp are not an easy option, just skip the first step in this recipe. 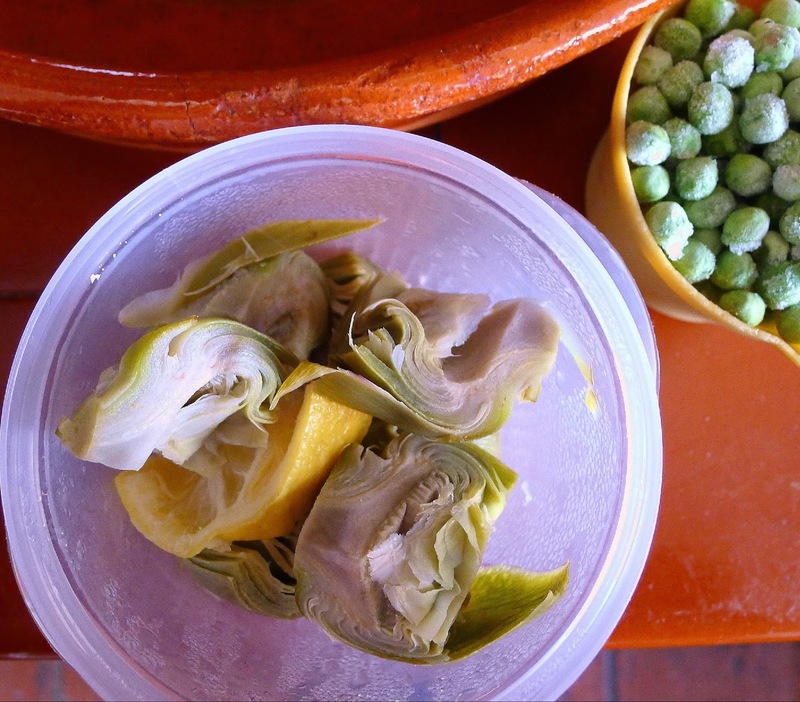 Par-boiled artichokes and frozen peas. Fry heads and shells to flavor oil. Peel the shrimp, keeping the heads and shells. Reserve the bodies. Heat the oil in a skillet. Add the shrimp heads and shells and fry them on medium heat until they change color. Remove from heat. 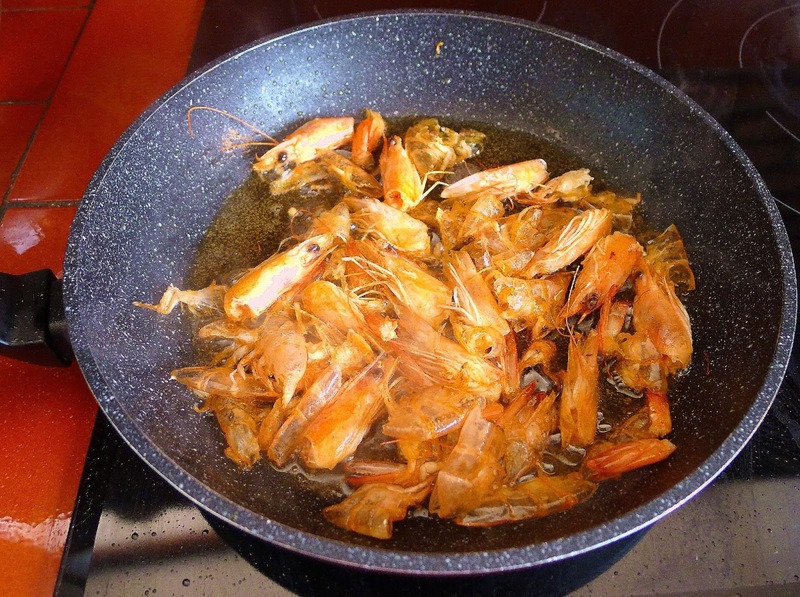 Tilt the pan so oil runs to one side and carefully skim out the shrimp heads and shells. When they are cool, discard. 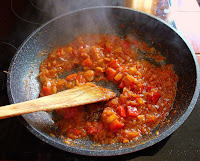 Add the onion, pepper and garlic to the oil and sauté on medium heat until softened and beginning to brown, 10 minutes. Add the tomatoes. Turn up the heat and cook until reduced to a thick sauce. Add the Sherry and cook until evaporated. Stir in the pimentón. Dissolve the saffron, if using, in the hot water. Stir it into the sofrito tomato sauce. Scrape all of the sauce into a 12-inch cazuela. Add the rice. 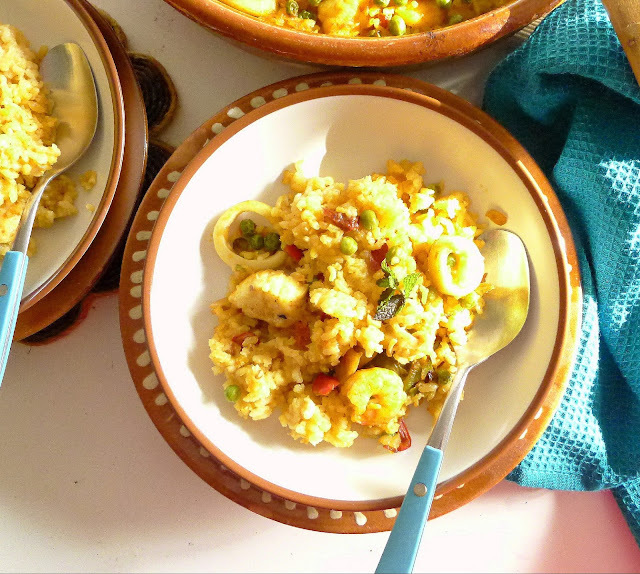 Add the cut-up squid and cubes of monkfish to the skillet and sauté them very quickly. Add to the sofrito and rice in the cazuela. The cazuela can be prepared up to this point at least 1 hour in advance. Preheat oven to 425ºF. Bring the fish stock to a boil. Taste it and add enough salt to season the cooked rice. Stir the hot stock into the cazuela. Add the peas and artichoke bottoms. Bake the rice uncovered. Careful of escaping steam when opening the oven! 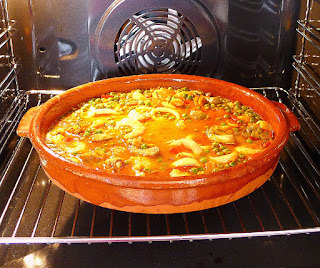 Carefully place the cazuela, uncovered, in the oven. Bake until the liquid just begins to bubble, about 20 minutes. Carefully slide oven rack partially out. Add the reserved shrimp to the cazuela and stir the rice. Lower oven temperature to 350ºF. Return the cazuela to the oven and cook until most of the liquid has been absorbed, but rice still has a kernel of hardness, about 15 minutes. Remove the cazuela from the oven and allow it to set 10 minutes. Garnish with sprigs of mint. Serve the rice from the cazuela. Earthenware cookware holds the heat for a long time. Black-eyed peas with roasted garlic.